We have issued two versions of the map, showing how the area changed across the years. The SW quarter of the 1894 map covers the centre of Hounslow, including High Street, Hanworth Road and Inwood Road; features include Holy Trinity church, Heston Hounslow station and Hounslow Town station (already shown here as disused). To the north Lampton Road leads up past Lampton House to Lampton. The London Road leads NE to Spring Grove, an estate laid out in the 1850s by H.D.Davies; at the centre of this is Spring Grove Road, once home to the naturalist and traveller Sir Jospeh Banks, but by the 1890s remodelled for Andrew Pears, of the soap family. Nearby is Woodlands, incl St John's church, part of Isleworth; Spring Grove & Isleworth station is near the east end of the map. At the foot of the map are Worton Hall and Worton Farm. Many orchards and market gardens between these communities remind us of the area's traditional occupations. The 1935 map covers the same area. Features now include the tramway and the Worton or Interworld Film Studios, famous first for many silent films, and later for films produced by Alexander Korda and others. On th reverse of this map we include a list of private residents from a 1933 directory. 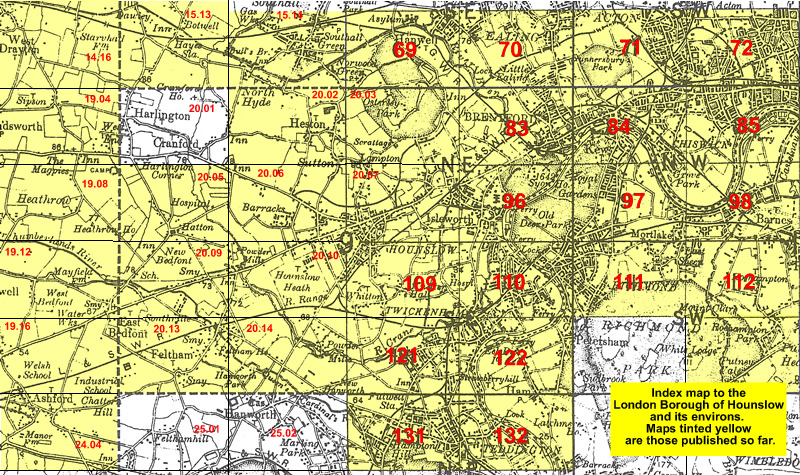 The map links up with Middlesex Sheets 20.03 Osterley Park to the north, 20.06 Hounslow West to the west, and London Sheets 96 Isleworth to the east and 109 Whitton to the south. Follow this link for a list of our maps for the London Borough of Hounslow, or here for a complete list of our London maps . Maps in the Godfrey Edition are taken from the 25 inch to the mile map and reduced to about 15 inches to the mile. For a full list of maps for England, return to the England page.